Florence Nightingale was a statistician! Florence Nightingale is well known for her selfless nursing of the sick, and her pioneering reform of healthcare. Less well known is that she was also an accomplished statistician! We take a look at some of her finest work. Read more about Florence Nightingale was a statistician! Through her work as a nurse in the Crimean War, Florence Nightingale was a pioneer in establishing the importance of sanitation in hospitals. She meticulously gathered data on relating death tolls in hospitals to cleanliness, and, because of her novel methods of communicating this data, she was also a pioneer in applied statistics. We explore the work of Nightingale, and in particular focus on her use of certain graphs which, following misreading of her work, are now commonly known as Nightingale's coxcombs. Looks like another great talk for anyone interested in the public understanding of risk. Coming up on October 30th, by Professor Stephen Senn, as part of the Cambridge Festival of Ideas. Read more about Does it all add up? 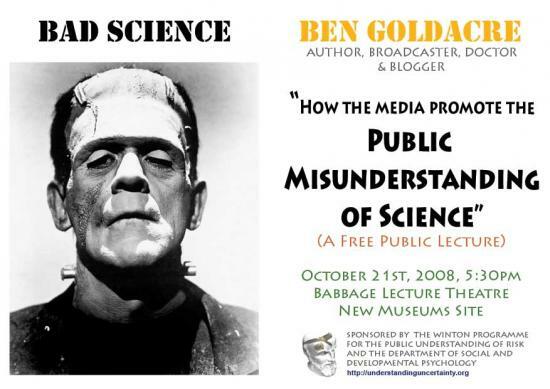 "How the media promote the public misunderstanding of science" on Tuesday 21 October at 5.30pm in the Babbage Lecture Theatre, New Museums Site, Cambridge. All are welcome to this free event, hope to see you there! The Babbage lecture theatre is on the New Museums Site in Cambridge, which you can find here. Time to hug a tree? The Risk and Regulation Advisory Council (RRAC) is trying to stimulate public interest in a debate about how to manage the 'risk' posed by trees. Apparently around 6 people a year are killed by falling trees or branches, which does not seem a major problem, but nevertheless the British Standards Institute has produced a draft standard (BS 8516) for inspection of trees on a regular basis. Read more about Time to hug a tree? One of our aims is to look at how the mass media portray risk stories, and what we might learn from that experience. The only way most people (including us) hear about potential risks is through the media, and understanding how they are reported may give us a better understanding of risk and uncertainty. Hello, and welcome to the first blog entry from the Understanding Uncertainty team! We hope you enjoy the site: it's only got a bit of content so far but there's lots more in the pipeline.